And contrary to the claims of its authors (one of whom is backed by the NRA), it does not prove that more guns equals less crime. The frenzy is a carbon copy of what happened when the so-called Harvard study was rediscovered back in 2013, and previously in 2012. However, despite its continued resurrection, Kates and Mauser’s work contains serious flaws. For starters, the phrase “Harvard study” is a misnomer, as the paper was not written by researchers at all affiliated with Harvard. Kates is a prominent, NRA-backed Second Amendment activist, while Mauser is a well-known Canadian gun advocate. Their paper appeared in the Harvard Journal of Law & Public Policy, a journal that, unlike most academic publications, does not have peer review. The publication describes itself as a “student-edited” law review that provides a forum for “conservative and libertarian legal scholarship.” The journal’s past contents include a thoroughly repudiated article, “What is Marriage?,” which argued that gay marriage was morally wrong. One function that publications like the Harvard Journal of Law & Public Policy serve is to provide a home for papers that wouldn’t survive vetting by other academics; research that can pass peer review is almost always sent to publications whose more stringent standards also come with greater reach. What’s more, the report by Kates and Mauser does not meet even the loosest criteria of an academic study, which requires either new analysis of an old dataset or boilerplate analysis of a new dataset. Kates and Mauser’s paper offers neither of these, instead relying on highly subjective eyeball comparisons of suspect data, without constructing a single statistical model. In their paper, Kates & Mauser make several bizarre and obviously false claims. They first state, without supporting evidence, that guns are not uniquely available in the United States, ignoring the fact that the U.S. now has one gun per person (double the rate of second-place Switzerland), and has, by any measure, the least stringent gun laws in the developed world. They then proclaim that much of the current gun violence debate is the product of Soviet propaganda. Kates and Mauser correctly note that socio-cultural and economic factors play a key role in shaping a country’s level of violence. 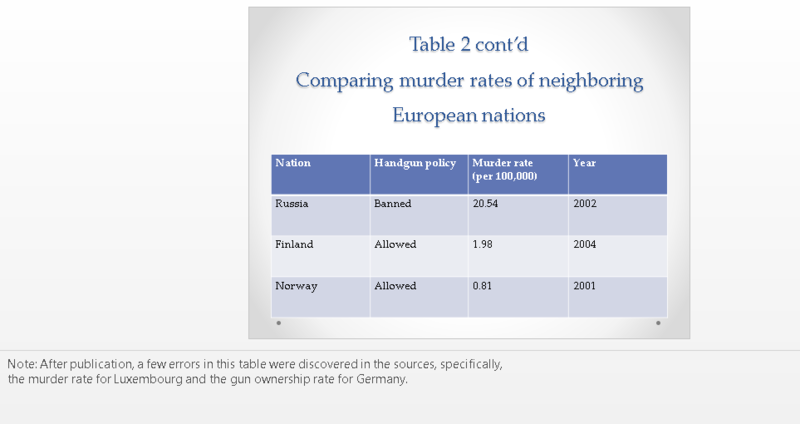 But their insight stops there as they then proceed to directly compare countries with dramatically different socio-cultural and economic conditions (like Russia and Norway) to draw conclusions about the efficacy of gun control. In doing so, they commit a cardinal sin of statistical analysis: not comparing likes to likes. To understand the social and economic factors that could significantly influence homicide rates, they should choose a basket of comparable countries with very similar conditions. Without controlling for these confounding factors, Kates and Mauser immediately undermine any conclusions they hope to draw. The authors proceed to compound these errors by using Luxembourg — a very small western European country of only 300,000 people — as the linchpin of their international analysis. Luxembourg’s scant population means that only a handful of murders could cause its homicide rate (measured by homicides per 100,000 residents) to fluctuate wildly. More problematic, the data from Luxembourg that the authors rely on is demonstrably wrong. Kates and Mauser cite Luxembourg’s homicide rate as a whopping 9.01 killings per 100,000 people in 2002. However, not only does that figure come from a source missing multiple years of data (a major red flag), but the United Nations Office on Drugs and Crime places the country’s homicide rate for the year in question at 1.4 per 100,000. This suggests that Kates and Mauser didn’t bother to double-check their source. Indeed, after the article was published, Mauser admitted that their data for Luxembourg was incorrect, an admission that was buried in the notes section of a PowerPoint slide. “People do not commit suicide because they have guns available,” the authors write. “In the absence of firearms, people who are inclined to commit suicide kill themselves some other way.” But the academic literature overwhelming shows otherwise. As we have written previously, reducing firearm access — especially among those groups most at risk to end their lives — reliably saves lives. This is largely because even with a 100 percent substitution effect (meaning everybody who would have attempted suicide with a firearm chooses a different method), the rate of completed suicides would fall dramatically, as other methods such as overdoses or hanging are far less lethal than firearms. The large majority of this research existed at the time Kates and Mauser wrote their screed. Moreover, while citing a National Research Council report earlier in their article when it suited their argument, they conveniently fail to mention that the same report also examined Lott’s work, and that 15 of the 16 panel members determined that the available evidence did not support his more guns, less crime hypothesis. As we have previously documented “More Guns, Less Crime” is an empirically and theoretically incoherent explanation for drops in the crime rate. Not only has this been demonstrated in at least eight independent reviews published within two years of Lott’s initial paper, but new studies, published after Kates and Mausers paper, have further debunked his findings. Kates and Mauser state that “recent analysis reveals ‘a great deal of self‐defensive use of firearms’ in the United States,” and go on to claim that there are “more defensive gun uses [by victims] than crimes committed with firearms.’” Both of these statements are false, the second blatantly so. Every single survey that has examined both defensive and criminal gun uses has found that criminal use of firearms is far more prevalent. The authors try to skirt that fact by comparing defensive gun use surveys by criminologist Gary Kleck with numbers from the annual National Crime Victimization Survey, ignoring that these two surveys use different methodologies, which renders such a comparison moot. Further, the surveys Kates and Mauser cite as supporting evidence suffer from several flaws, not least of which is that they produce estimates that are mathematically impossible. An emerging body of research has shown that using a gun in self defense is no more effective at reducing the risk of injury or property loss than doing nothing at all, and that the actual number of defensive gun uses in the U.S. are much, much smaller than the estimates parroted by the National Rifle Association. If you want further evidence of the paper’s numerous flaws and falsehoods, David Hemenway, an actual researcher at Harvard, has issued a rare and brutal takedown, and one blogger has taken a much more detailed look at the paper’s opening statements. Despite its lack of academic rigor, Kates and Mauser’s paper will inevitably be recirculated again and again. Paradoxically, this is because gun-rights advocates believe it is product of Harvard, the same university that conservatives frequently denigrate as a bastion of elitism.